The investigation into Hillary Clinton's use of a private email server while serving as secretary of state appears likely to end with no criminal charges. Federal Bureau of Investigation Director James Comey announced on Tuesday that the FBI found no evidence Clinton intentionally used the server to send or receive classified information. "Our judgement is that no reasonable prosecutor would bring such a case," he said. The announcement comes a little more than three weeks before the Democratic Party is set to officially nominate her as its candidate for president. But it was not all good news for her. Comey criticized Clinton's actions, saying they were "extremely careless in their handling of very sensitive, highly classified information." And Republican Party leaders said they would continue to make her use of the private email server a campaign issue. The FBI's call for no criminal charges against Clinton is likely to stand. "Although the Department of Justice makes final decisions on matters like this, we are expressing...our view that no charges are appropriate in this case," Comey said. Attorney General Loretta Lynch announced last week she would accept the decisions of the FBI and career prosecutors in the Justice Department. A career prosecutor is a lawyer who remains in his or her government job no matter which party controls the presidency. Donald Trump, the likely presidential candidate of the Republicans, criticized Comey's announcement. He tweeted, "No charges Wow!" In an earlier tweet, he said, "Very, very unfair. As usual, bad judgment." Clinton spokesman Brian Fallon said her campaign is "pleased that career officials" have "determined that no further action by the department is appropriate." He added that Clinton has already said it was a "mistake to use her personal email and she would not do it again." 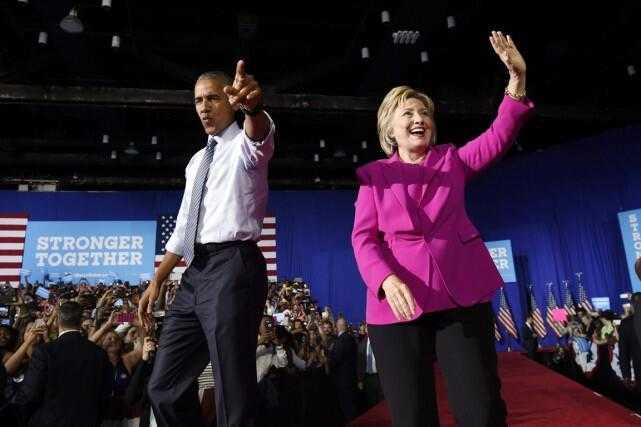 The FBI's announcement came on the same day Clinton campaigned for president with President Barack Obama for the first time. They traveled on Air Force One together to North Carolina, a state that Obama won in 2008 but lost in his 2012 re-election. Trump also campaigned in North Carolina on Tuesday. "It was no accident that charges were not recommended against Hillary the exact same day as President Obama campaigns with her for the first time," Trump said. He said the system is "rigged," suggesting it helps some people, but not others. "The normal punishment, in this case, would include losing authority to handle classified information, and that too disqualifies Hillary Clinton from being President," Trump said. Last Saturday, Clinton met with FBI agents in Washington for over three hours – a sign that the long investigation was nearly over. Last week, Attorney General Lynch said she would not make a decision on possible criminal charges in the case. Lynch made the statement after she was criticized for meeting with former President Bill Clinton, Hillary Clinton's husband, while both were at an airport. Lynch said the investigation did not come up during her 30-minute talk with Bill Clinton. But Republicans and some Democrats said such a meeting was a mistake – while an investigation was continuing. At his press conference, FBI Director Comey said it is possible that foreign enemies of the United States read Clinton's emails. He said the FBI found no evidence that Clinton or her staff intentionally removed emails. But he noted that agents did find "several thousand work-related e-mails" not given by the State Department. He reported that FBI agents investigated for a year, talked to many people and looked at over 30,000 emails. Clinton has said that she did not receive or send emails that were classified – at least at the time they were sent or delivered. But Comey said 110 emails contained classified information at the time they were sent or received. Eight, he said, were "top secret." He said Clinton and other State Department officials "should have known that an unclassified system was no place" to send and receive emails. House Speaker Paul Ryan, a Republican, criticized the FBI finding against criminal charges. "While I respect the law enforcement professionals at the FBI, this announcement defies explanation," he said. "No one should be above the law." He may still face criminal charges. No matter who point out our shortcoming, we will correct them. As usual, she had bread and egg for breakfast. 1.The investigation into Hillary Clinton's use of a private email server while serving as secretary of state appears likely to end with no criminal charges. The test tube is closed at one end with a hydraulic seal. You always believe somehow that the world will end with your death. 2.And Republican Party leaders said they would continue to make her use of the private email server a campaign issue. Property values continue to advance rapidly. After what had happened he could not continue to work there.